It's been a long couple of weeks. After a 5 day drive half way across the country, we moved in, our kids started school and I'm still trying to get into the habits of a stay at home mom. I have to say it's pretty freeing to be able to say I can go pick up a carton of milk at any given time. Sounds strange, but in NYC that just wasn't an option for a working mom. Working an 8 hour day with a 1 1/2 hour one way commute. There was no time for anything. So this is freeing. I'm sure there will be moments of why did I do this? But for right now, being able to take my kids to school and my daughter out on a lunch date whenever I want has been amazing. So while we were out picking up groceries on a Tuesday afternoon, my daughter made the request for funfetti cake. So my foodie brain goes off in a... I can make that! 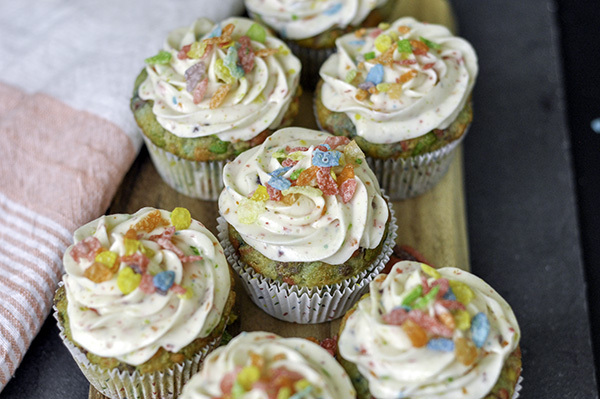 So off went on a bit of a tangent and came up with these Fruity Cereal Funfetti Cupcakes! I think cream puffs were one of the first "fancy" desserts that I ever made. They are my dad's favorite. I remember driving to Pennsylvania on the weekends and stopping at a gas station for cream puffs on our way there. It's weird now that I think about it. But they were pretty good none the less and these cereal milk cream puffs combine all my childhood memories into one delicious treat! Growing up I use to watch my aunt make cream puffs. I didn't know what she was doing at the time, but she made her choux pastry by hand. She would beat the dough with a wooden spoon, adding one egg at a time. They were traditional and came with a heavy pastry cream. But for cream puffs I (and my dad) prefer a light airy whipped cream filling, or in this case, cereal milk whipped cream! I started this recipe with a standard choux pastry. Butter, water, and salt are melted together. I add flour to form a basic dough. And this is where true arm strength comes in...I don't have any, so I put my dough into an electric mixer and beat in the eggs one at a time to form a very sticky, eggy dough. The dough then gets pipped into concentric circles to form the puff shape. Now for the fun part, back when we were young and newly married, my husband and I would take late night trips out to the Momofuku Milk Bar in the east village. I loved their crack pie and their Cereal milk ice cream. It was reminiscent of the flavored milk you get left over after eating a bowl of your favorite childhood cereal, it was delicious! So why not try to infuse the cereal into the heavy cream for a cream puff filling? Yep, so in goes the fruity cereal to steep. And an hour later, you have cereal cream. My goodness is it good. And on top? Well, on Japanese cream puffs, they put a thin layer of sweet dough on top of the choux pastry before they bake, resulting in a sweet crunchy crust. So for this version I'm adding crushed Capt'n Crunch for topping. Yep. Everything is better with Captn' Crunch. A crunchy sweet crust filled with cereal flavored whipped cream. My daughter licked the cream clean from every surface. It's that good. I hope you enjoy the fun take on the traditional cream puff as much as we did! Stir in Sugar, crushed cereal and flour. Add the fruit flavored cereal and mix. Let steep for 1- 1 1/2 hours in the refrigerator. Add sugar and whip till still peaks. Set aside in the refrigerator. Melt butter with salt and water in a large saucepan over high heat. When butter is melted and it starts to boil, remove from heat and...Immediately add in flour all at once, and beat into a dough with wooden spoon. Beat in the eggs one at a time, making sure it's fully incorporated before adding the next egg. The dough will be VERY sticky. It's ok, its suppose to be sticky! Spoon dough into a Piping bag and pipe concentric circles onto paper-lined tray. using your fingers pat down any tips to prevent them from burning. Top with a small handful of the previously made cereal topping. Immediately bake 25 min until well puffed and browned then turn down the oven to 210F and continue to bake for 40 min to dry. Once puffs are cooled,cut each puff in half and pipe in whipped cream filling.